In Record Drought, California Golf Course Ethically Keeps Greens Green Golf courses are water hogs, and that thirst is especially notable as California's drought grows in severity. At Pelican Hill, a top golf course near Los Angeles, water conservation is an obsession. At the Pelican Hill golf resort in Newport Coast, Calif., water conservation is an obsession. In drought-stricken California, golf is often seen as a bad guy — it can be hard to defend watering acres of grass for fun when residents are being ordered to cut their usage and farmers are draining their wells. But golf is a $6 billion industry in the state and employs nearly 130,000 workers, according to the California Golf Course Owners Association. So while the greens are staying green, some golf courses are saving every drop of water they can. 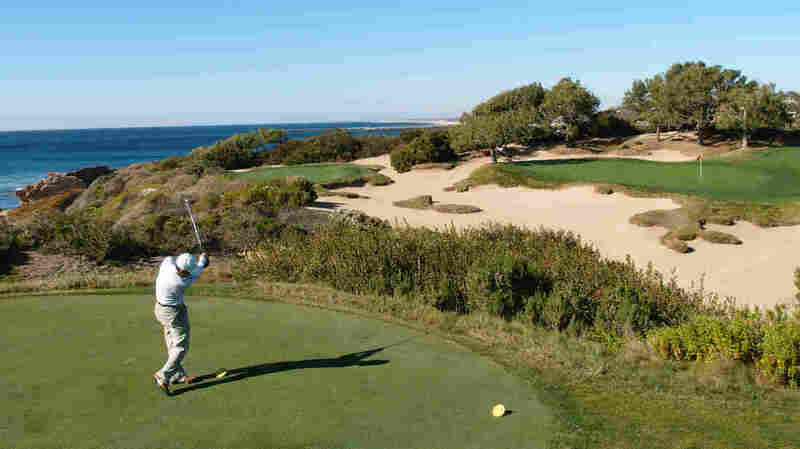 Stephen Friedlander, vice president of golf at The Resort At Pelican Hill in Newport Coast, just south of Los Angeles, says: "When people say, 'Well, that golf course is watering their grass,' if they are talking about Pelican Hill, yes we are, and we're using reclaimed water. And we're using reclaimed water in a very specific, measured way." A lot of golf courses use recycled or reclaimed water, but Friedlander says Pelican Hill is different. "We're here at the practice facility at Pelican Hill golf club. We're looking at a large, 10 acres worth of land that's mostly warm season Bermuda grass," he says. That grass was chosen because it needs less water and doesn't grow as quickly. And in the non-playing areas, the course uses native bushes that use no water. That said, the course is as swanky and fancy as it gets, and Friedlander says the players laying out more than $300 for a round shouldn't notice any differences in the greens and the fairways. The key is the irrigation system. Course managers can monitor and control irrigation from their smartphones. "You can water specific areas of the golf course without watering other specific areas," Friedlander says. "We can isolate each head, so instead of turning on 50 heads, and overwatering an area that doesn't need water, we can turn on one head and water one area that might need water." Pelican Hill says it saves 50 million gallons of water each year — recycled water, mind you. There is something else that makes Pelican Hill special: rainwater. "We want to capture every bit of rainfall we can. One, it's cheaper and two, it's a very high-quality water," says Sat Tamaribuchi, who helped design the course's conservation system. Any rain that falls on the buildings, pavement and cart paths goes into one of the course reservoirs — which form the major water features on the course. And underground, there are giant cisterns that hold millions of gallons of runoff water from the course. "As it turns out, because our cistern system and the lake systems are so large, ever since the work was done, no stormwater has left the golf course, essentially," Tamaribuchi says. Golf pro Steve Friedlander admits that a golf course in a wealthy town like Newport Coast has a real incentive to save water, but he says it's not just a California problem. "If you're in the golf industry and you're not a water quality and a management person, then what are you doing?" Friedlander asks. Which means, Friedlander says, that golfers shouldn't have to feel bad about hitting a few balls — or at least trying to. 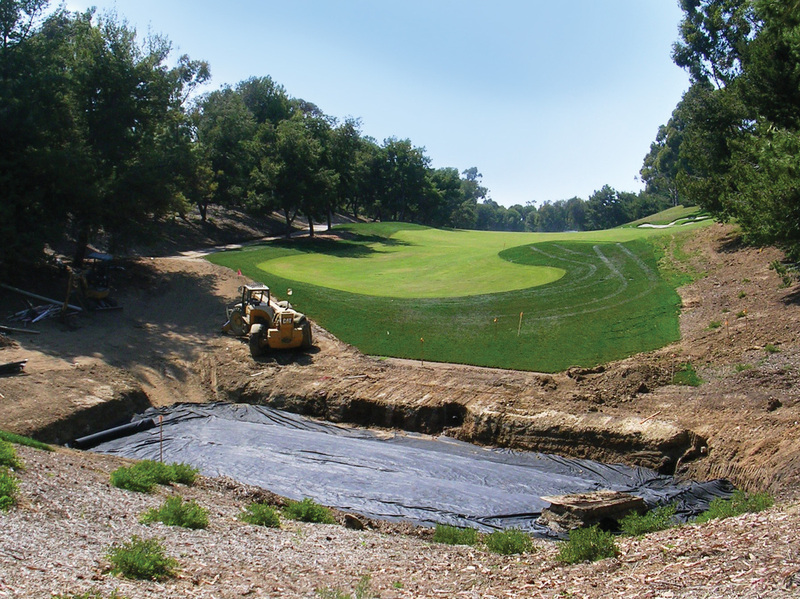 A bio-filtration basin, pictured during installation in 2007, captures water runoff from the Pelican Hill golf club's maintenance facility. The water is filtered through grass, gravel, sand, soil and filter fabric into an underground drainage system.